The Stamina Elite Total Body Recumbent Exercise Bike is one of the few recumbent bikes that have the ability to offer overall body workout. 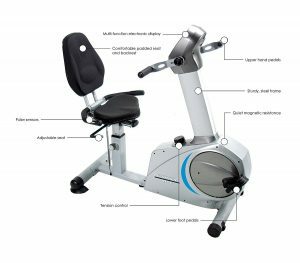 One cannot be wrong to say that this recumbent bike is an outstanding and a unique machine that could do a lot of positive things to your entire body muscle groups and both beginner and advanced users will really appreciate this machine. It has a design that designated moving arms at the front of the bike that a user could use to pedal with the hands which in return work on the upper body. This is the major reason why it is unique from the traditional recumbent bikes. Moreover, it has received a lot of positive reviews from real users which indicate that the machine is popular and much loved by most of its users. Currently, it has over one hundred Amazon customer reviews with an approval rating of 4.3 out of 5. Most users expressed their satisfaction with how quiet and smooth the machine runs. As a matter of fact, one particular verified Amazon customer revealed that both she and the husband had knee replacement surgery and this machine is helping them to recover as they use it daily. Traditional recumbent bikes are known for being less stressful to the joints while they offer tremendous cardiovascular workouts that end up allowing the user to burn out a lot of calories but only a few like the Stamina Elite Total Body Recumbent Exercise Bike provide full body workout. It also has ergonomically designed seat that provides exceptional comfort during workouts. There are 8 levels of magnetic resistance that provide the user with the easy and challenging workout as well. Remember that this machine is smooth and quiet? That could be attributed to the type of resistance and drive system it possesses. One can still use the bike without power because the console is powered by the battery, no cord or power outlet required. The Stamina Elite Total Body Recumbent Exercise Bike is a perfect machine for home use and can be placed anywhere in your home. This recumbent bike made it in our best recumbent bikes list; you may check it out if you wish to view other options as well. This recumbent bike has a sturdy steel construction that offers solid workouts. A bike that could last and withstand years of prolonged hard use. It has got large and wide stabilizers at the back and front that ensure that the bike does not wobble or move during an intense workout. You know that a workout that is smooth and void of wobbling will make the user be relaxed and not distracted by the annoying movement of the machine. A user can actually choose to amuse himself by watching a favorite TV show or listening to music while he gets on with working out. The machine seems to hold up and lasts longer because no user has complained of it not been durable except one user that complained it broke down after almost 3 years of virtually daily use of the machine. 3 years is a bit fair but not enough to make anyone that bought the bike to feel he has gotten the worth of the money spent on buying it. However, machines cannot be trusted 100% in terms of durability but if the bike promises a higher percentage of lasting a reasonable amount of time then it worth purchasing and it appears this bike does make that promise. It is advised and recommended to buy a rubber mat along with the bike in order to further boost the stability of the machine on an uneven floor. Older individuals of 70 and 79 years old have expressed a lot of love for the Stamina Elite Total Body Recumbent Exercise Bike and the 79 years old had this to say, quote ‘’Perfect exercise for a 79-year-old man!’’ I tried all types of exercise equipment at fitness stores, then seen this one advertised. I could not find one in any store, so I took a chance and ordered it, delivered in 5 days to my basement. Took 2 hours to put together and works perfectly. I had a question, called Stamina, they put a bike together, called me back in one hour and solved my problem’’ end of quote. The machine simply for the old and young alike and the majority of the users have expressed so. The warranty is 5 years on frame and 1 year on the parts. This is not so great since there are other cheaper recumbent bikes that come with a lot more better warranty. However, it is still good that it covers the frame for 5 years though. The seat has always been the core source of comfort in recumbent bikes especially if it is well contoured, padded and adjustable. Reason being that, if the seat is well padded and designed it will convey comfort without the user feeling aches and pains which can easily promote boredom and ultimately make the user to workout to full potential. If the seat is adjustable, it can accommodate most different sizes of users conveniently. Fortunately, the Stamina Elite Total Body Recumbent Exercise Bike has both elements that could make a bike to be comfortable and that is adjustable, and well padded contoured seat. The seat can be adjusted up/down as well as forward/backward. 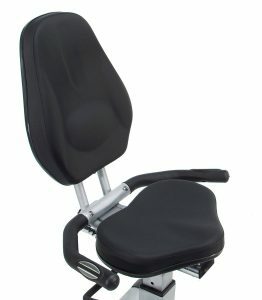 It is also well padded with good cushion and a unique backrest that could help minimize pain in the lower back. The seat’s ability to adjust goes a long way in helping the user to find the best suitable workout position. A user can easily make these adjustments while seated especially the forward and backward adjustment of the seat. The specific size of individuals this machine can accommodate conveniently is not officially stated by the manufacturer but we got some clue from the users’ feedback and they are rather mixed. Certainly, this machine will be fine for individuals 5 feet 4’’ to 6 feet 2 inches. But folks that are shorter than 5 feet 4 inches or taller than 6 feet 2 inches may and may not fit in depending on the legs (if they have long legs). However, taller individuals have better chances of fitting in but may not be able to fully extend their legs and also should be careful to adjust the seat in order to prevent hitting their knees on the hand pedals. As for the shorter folks, they may have to struggle to reach the pedal by stretching their legs or even having to sit at the tip of their seat in order to reach the pedals, therefore it can help to stuff cushion at their back to help support them better. To adjust the seat upward or downward you simply use the knob at the back and beneath the seat post, unscrew it and pull to release the pin and then adjust the seat upward or downward at your preferred position and re-insert the pin in the pre-set hole and tighten up. The user must dismount in order to do this adjustment unlike adjusting the forward or backward seat position while still seated. Nevertheless, you don’t have to worry if multiple users can use and adjust the seat easily and quickly without taking a lot of time doing so because it won’t. Most users say they are comfortable with the seat. One of the users even says he finds the seat a lot comfortable than the previous bike that he had. It has got a step-thru design that allows everyone to simply and easily step on and off the machine without any hassle. No need of playing karate while trying to get on or off the seat, which is why even the very elderly find it very convenient. Nevertheless, if the seat is too close to the front encased drive then you may have to raise your leg over to the other side in order to get seated but once the seat is adjusted in such a way that there is enough room between the seat and the encased drive then getting on and off will be a step-thru. The backrest and the seat move together when adjusting the seat which means one cannot adjust the backrest to a different angle but the standard angle is still great and comfortable for the back. Aside from the hand pedal at the front of the bike, it has the traditional handlebars on either side of the seat with the heart rate sensors embedded in them which help to transmit the user’s heart rate data to the monitor so that the user can always maintain target heart rate zone at all times during workouts. They are positioned strategically so that they can provide the much-needed support and leverage to the user when pedaling with the feet. The handlebars are also covered with plastic sort of material in order to provide comfort to the hands and palms. The fact that this machine is a quiet and smooth point to the possibility of the bike using a belt drive system that is famously known for operating smoothly and quietly. Belt drive usually does not require any form of maintenance like the counterpart chain drive. Moreover, the drive system is encased in a plastic material at the front of the bike to prevent exposure to dirt that could create a problem, prevent harm to children or pets and even the user’s ankles as well. This bike comes with 8 levels of magnetic resistance system that can be controlled via the tension knob that is below and in front of the seat. Some individuals have wondered if the hand pedals have resistance effect; yes they can be increased or decreased only when it is being used without pedaling with the feet. In other words, when you pedal with the feet, the hand resistance stays standard and doesn’t increase until when used alone that it does. The resistance knob is positioned in a strategic place that will make it easy to be reached by the user and it is also easy to use. On top of the knob are the resistance levels clearly indicated and to increase the resistance simply turns it clockwise and anti-clockwise to decrease the resistance. The resistance is very effective because it can get almost anyone’s heart rate up when level 8 is used. Therefore, users can get challenging workouts that can quickly help them get rid of lot calories. Nevertheless, most advanced users that have better fitness level may not really find the 8-level resistance quite challenging. The resistance is best for those that wish to gain and maintain a healthy body, not for those looking for serious challenging workouts. It is also very smooth and quiet during operation and when transiting from one resistance level to another. The console has a basic monitor that displays workout data such as the time, speed, calories burned, distance and heart rate. The monitor also has a scan function that displays these workout data one at a time for several seconds and then displays another and continues in this pattern rotationally. This helps the user to keep track of workout progress and can motivate a user to workout harder. The heart rate data is only displayed when the user grips the handlebars with the heart rate sensors in them and the speed and distance are measured in miles. Even as a user can use the SCAN function to have all the workout data automatically display so also he can choose to have just one measure or value to display at a time and steady. A user can set a target using the buttons (mode, reset, down, up, and enter). One can easily set a target for heart rate and gets beeps when the target is exceeded and a user can also set a target for distance, time, and calories and the console will begin a countdown from the target. The monitor is not the backlit type of console because it is a pretty basic type. Therefore, readability will be great when it is being used in a well-lit room or location otherwise, a user will have to strain the eyes in order to view the metrics on the console. To get accurate heart rate reading, a user has to make sure that the hands are moist and warm, however, the heart rate reading is considered not to be 100% correct. This problem is not prevalent with the Stamina Elite Total Body Recumbent Exercise Bike but with any other bike and even the most expensive ones. The HR chest strap is a lot accurate and reliable than the handle grip sensors but they are still useful though. The bike does not have the ability to track and store your workout progress you can improvise on this aspect by may be doing it manually with a spreadsheet and no preset programs available either. As aforementioned, the machine or the console does not require power in order to work. The console is being powered by 2 AA batteries that can be installed and used easily. Therefore, you can use this bike even when there is a power outage and also when the batteries in the console are dead. The only thing is that you will not be able to see all those workout metrics such as the distance, speed, time, calories burned, and heart rate. The console can be started manually by a push of a button and can also automatically start when the pedal is being used. It goes off if there is no activity on the bike for certain several minutes and every value will reset when the console is turned back on again. 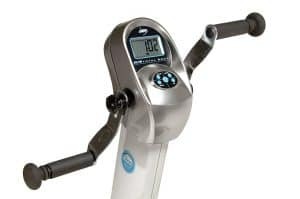 The hand pedals are the features that really make the Stamina Elite Total Body Recumbent Exercise Bike stand out from the rest…at least most. With the hand pedals, a recumbent enthusiast will have the liberty to work on the upper body as well. The inclusion of the hand pedals makes it possible for users to have full body workout that affects almost every muscle groups of the body such as the back, shoulders, arms, legs, chest, abdominal, etc. A user can choose to use the hand pedals alone to workout or to use both with the foot pedals. When both are used concurrently then the resistance will only be effective on the foot pedals but when used alone at different times then the resistance can work for both with the same resistance tension control knob. The resistance does not work on either of them when used in reverse. The handle pedals design is such that prevents blisters and slippage during a workout. Interestingly, the hands of the hand pedals can be adjusted so that different users of different sizes may also find their suitable position. 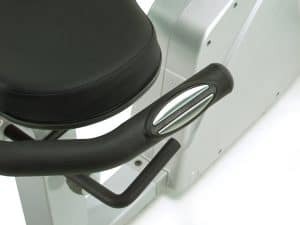 If not well set alongside with the seat, there will be the tendency that the user’s elbow or hand will be banging on the knees during a workout. Unfortunately, this unit does not come with any other accessories such as water bottle holder, MP3 port, or speakers. Therefore, you have to just improvise on these things by placing your tablet or MP3 on the tablet close to you so that you can watch a movie or listen to your favorite music. The same thing with water, get a bottle of water and place it on the table close to you for hydration. The bike is non-foldable with 50’’ by 24’’ footprint and weighs about 117 pounds which could be considered average in weight. This is certainly not the sort of bike you can store under the bed or inside the closet. It has to be placed somewhere under the stairs that have enough space or close to the wall. It is integrated with small transport wheels that could aid in the relocation of the bike conveniently by lifting it from the back so that most of the weight will be at the front. One person can lift it and wheel it to the location it is intended to be stored or used without much hassle. Like most of the transport wheels found on other bikes they best work on hard surface or floor, otherwise, using them on a soft or carpet floor can cause some friction. Also be careful when using on a wooden floor so as not to dent or scratch the floor with transport wheels. This bike has positive reviews and feedback and obviously popular. It has an approval rating of 4.3 out of 5 (at the time this review was written) of over 100 Amazon customer reviews. This is to say over 85% of its users are impressed with the overall bike performance and features. Most of the users are willing to recommend it to friends except of course very few had negative complaints about it. You may click right here to find out what the real Amazon users are saying right now. It has a battery powered console that can be used without the need for a power outlet. It has contact heart rate monitor that allows a user to observe workout progress. Warranty of 5 years on frame and 1 year on parts. It does not have accessories such as water bottle holder, tablet/magazine shelf, MP3 port, etc. The resistance may not be challenging enough for some advanced users. The shipping cost and delivery duration time of the Stamina Elite Total Body Recumbent Exercise Bike solely depend on the retailer you are purchasing from, however, Amazon provides free shipping and usually delivers the product to your doorstep in about 3 to 5 days depending on your location. The bike is usually delivered with the major components preassembled leaving you with other smaller components to fix. It is very easy to assemble since it comes with an instruction manual that will walk you through the steps of assembling it and It takes 1 to 2 hours to fully assemble. You are expected to fix the stabilizer bars, pedals, seat assembly, rear frame, seat, backrest, hand pedals and the handlebars on either side of the seat. Tools for assembly are also included but you may require your own personal tools to successfully assemble. The bike does not require any serious or major maintenance but to wipe clean of dust and sweat all the time. The Stamina Elite Total Body Recumbent Exercise Bike is certainly a recommendable recumbent bike especially for those that wish to gain a healthy body and not necessarily to experience extremely challenging workouts. This is an ideal bike for home use and for everyone that wishes to use a recumbent that is also able to work the upper body. However, we expected it to have some extras/accessories and a better console. That being said, it is still a recommendable bike from us (even though we think there is still room for improvements) and of course from most individuals that have used it. If you still have any questions you need answers to do not hesitate to holler at us and we will be glad to respond accordingly.